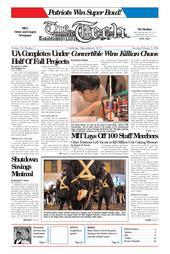 One aspect of this makeover that has come out in the open this past semester is the idea of MIT adopting a diversity General Institute Requirement. The lack of education in the areas of race, ethnicity, and culture is a major problem in our society today. Racism, discrimination, and segregation are severe effects caused by this problem, which currently plague communities across the world. Using education as a tool to inform others in our society about the many diverse people in this world would help to eliminate the discrimination and prejudice that cripples our society on a daily basis. A diversity requirement is not new for most colleges and universities. According to www.diversityweb.org, 63 percent of colleges and universities either have in place a diversity requirement or are in the process of developing one. Some notable schools with diversity requirements in place include Boston College, Brown University, Penn State, UC Berkeley, UCLA, and Wellesley College. Most of these schools require their students to select from a list of designated classes to complete the diversity requirement. Many colleges and universities are beginning to recognize that they can play a pivotal role in addressing the enduring problems of race relations. For example, the University of Virginia experienced a highly publicized racially charged incident on their campus just last year, when Daisy Lundy, a candidate for a hotly contested Student Council election who is of African-American and Korean heritage, was attacked by an assailant who allegedly used a racial slur during the attack. After this incident, the University of Virginia realized that they could play a role in preventing future racially charged incidents and established a committee to explore a diversity requirement for their school. Will it take something like this to occur at MIT in order for the institute to realize that they play a pivotal role in addressing these enduring racial problems? For years, MIT has tried to use different approaches to promote awareness and understanding on the issues of diversity and race by offering a number of racial programs, extracurricular activities, workshops, and discussions. Many students and even faculty members of our campus have overlooked these opportunities. Now it is time to take a bigger step and increase our efforts. Alumni are very important people here at MIT. They are motivators and mentors for many students. Alumni could continue to play this role, but on a more active basis. If we have a mandatory class on diversity, we could have alumni come and speak to the classes. Dr. Clarence Williams’ book, “Technology and the Dream,” would be a great place to start searching for alumni dedicated to addressing diversity issues on campus. These alumni could come and reflect on their experiences here at MIT, and inform the students how much has changed or stayed the same since they were here. We must continue to break down barriers and progress forward. Actual testaments would be great exposure to what is going on or has gone on in our society, instead of simply reading articles or watching videos. A diversity class would not only improve the first year educational experience, but also the lifetime educational experience. Because most first year students come from high schools that presented students with homogeneous racial settings, they would greatly benefit from a college where there is so much diversity and the opportunity to discuss and explore the different people around them. Taking this class will allow students to learn more about everyone around them and feel more so a part of the crowd. When the class ends and the students begin the transition into their sophomore year, they could begin taking full advantage of the environment MIT provides and develop into better leaders. Advocates for Awareness (AFA) held a forum this past November to get the opinion of the MIT community regarding the adoption of a diversity GIR. The audience consisted of about 60 students, faculty, and administrators who generally supported the idea of having a diversity GIR. The structure of the class was the main area of debate. One of MIT’s current courses, 11.023, “Bridging Racial and Cultural Differences,” was suggested as a model for the class. At the end of the forum, a committee was formed to continue to investigate the idea of MIT adopting a diversity GIR. This past semester, Tobie Weiner’s class Solving Problems in Race and Education (17.907) took on the project of assessing the feasibility of implementing a diversity GIR as its final project. The class will continue to investigate the possibility of a diversity GIR this upcoming semester. Members of the committee created after the AFA forum will also work towards the goal of helping to implement a diversity GIR. We are currently moving towards the light in seeing a diversity GIR at MIT. A number of students who support the idea have applied to join the task force on the educational commons and the student advisory group for selecting the next MIT President in order to provide a voice for the adoption of a diversity GIR. If you are interested in learning more about the idea of MIT adopting a diversity GIR, e-mail Advocates for Awareness at afa-exec@mit.edu. Terrence R. Strader ’04 is a member of the Committee on Campus Race Relations and the founder of Advocates for Awareness.